Don't confuse this with Mutabal. I invested hours of my life researching the two dishes and I hope I managed to clear the question as which is which. Again I do apologise for repeating this recipe but as with Mutabal this is a very common question I get asked all the time. Regarding the spelling, the one I used seems to be the most widely used world wide. In Syria we pronounce it with "J" at the end, Baba Ghanouj, but for the benefit of non Arabic speaking readers I decided to use the spelling adopted by Wikipedia for all my posts. This will make it easier to google if needed. Baba Ghanoush is an aubergine based mezze. Pomegranate Molasses gives it a nice sweet and sour fruity flavour. This dish is best served next to kibbeh. It works very well with grilled kibbeh as it offers a nice contrast to the fatty spicy stuffing of the kibbeh. Chop the tomato finely and add with the rest of the ingredients to the aubergine. Mix well and drizzle with olive oil. You can adjust the quantities of the ingredients as desired. i think this publiclly mixing between the two dishs coz the egyptians call - mutabal - as babaghanouj, or vice,-versa i don't remember . i love baba ghanoug, do u happen to know anything about the origin of the name? It is not only the Egyptians that mix them up it is more wide spread. Wikipedia puts them under single entry. The name question is an interesting one. I will try to do some research about it. How beautiful. I will have to try this soon! gorgeous! Your recipes are always so delicious, and well researched. A friend recently sent me some sumac. Do you have any recommendations for using it? The main dish to cook with it is Musakhan, A Jordanian/Palestinian dish. It is chicken baked with onion, sumac and arranged over thin bread. The original dish is very rustic (a bit too rustic to be honest with you) In Syria we adapted and modernised the original musakhan recipe. I was planning to put this on the blog but didn't get around to do it. 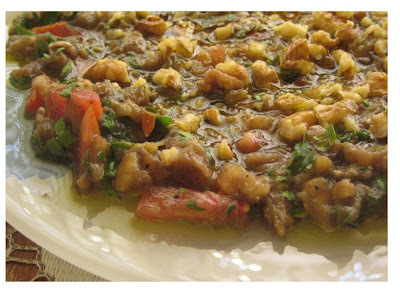 There is another dish from Aleppo called Kibbeh Sumakieh which is kibbeh cooked in aubergine and Sumac stew. I never tasted this dish before but I think I might be able to dig a recipe for you. Email me on UKFBA if you want those two recipes. Thank you! I have been searching for a recipe to recreate the baba ghanouj we had in Syria this summer. This is the first I have been able to find that uses pomegranate and not tahini. Now to find a recipe for makhlooba... any suggestions? welcome to my blog. I hope you would like this Baba Ghanoush recipe. I would make mine slightly different but this is a good recipe. I'm still confused about the naming here as well. We call both dishes batinjen mtabbal and baba ghannouj. the distinction is not very clear. I'll check with mom, as usual. In Syria it is very clear, mutabal is mutabal and baba ghanoush is baba ghanoush. Out side Syria things get a bit blurred. Marhaba Khhayye, yours is the first I have seen to mention, tomato and hamid rammaan, but possibly you might also have heard that charred, grilled red/green peppers is an indispensable ingredient together with finely crushed garlic. * de-skinned and all together finely chopped. This, I think, is the true BabaGhanouj; the dish's etymological meaning being "he who gets spoiled by his father". I don't know who decides what is "true" Baba Ghanosh and what is not. There are for sure many variations of the recipe. These varies from city to city or even from family to family. I have tried many different versions of the dish but for example I never tried one with grilled tomatoes like you mentioned. Thinking about it, I don't think I even tried one with grilled peppers. I definitely tried many with raw red and green peppers. Regarding the name, the meaning is the easy part. Why is it called that name is the mystery. Another great recipe! Was wondering what to do with all the aubergines taking up space in my fridge so made this and both hubby and I loved it. I added a dash of lemon to make it more tart but other than that followed the original :) Thanks Kano! Interesting with the nuts in it, I've not had it that way before. This has to be my all-time favourite mezze. I live in Qatar and luckily can buy this readily and cheaply. I made it for the first time today and I was thrilled with the result. Delicious and nutritious. Thanks. Oh and yes, mutabal and baba ganouj are often confused in Qatar too. Welcome to my blog. So glad you tried the recipe and liked it! I have just discovered thsi blog and am delighted. No middle eastern stores in the Borders, but a have a knack of grabbing ingredients when I am occasionally in a city. Welcome to my blog. You must be the same perosn I emailed back today. Either way, enjoy the blog and keep coming back. hehee.. again.. i keep comparing with Aleppean versions of mutabbal and baba ghanoush (i have read ur well done scientific study on both) but yet we still add garlic & some lemon to baba ghanoush + chopped red+green pepper :) and we sometimes sprinkle shwayet rumman on the top.. I have tried so many different versions of Baba Ghanoush including using garlic and pommegranate. In some restaurants in Damascus you see red and green peppers used but not in home cooking. In Jordan, especially in Amman, they make a baba ghanoush that is different from moutabel (pardon my spelling). In Aqaba where I live, I can't even get baba ghanoush as they are addicted to moutabel or Lebanese raheb. I love pomegranate molasses and never miss a chance to eat something with that as an ingredient. I can't wait to try your recipe. I hope that some day Syria will be a place to visit again. I was there in the fall of 2010 and loved it. I tried to take my sister there in April 2011 but we decided to cancel as we would have had to pass by Dar'aa to get to Damascus. I hope they are not destroying Aleppo as I write. Welcome to my blog. Hope you like the recipe. Thanks for a clearly-written recipe -- it turned out great on the first try! Welcome to my blog. I am delighted you liked the recipe. I hope you will have a chance to try a lot more. I will try it with roasted tomatoes sometime as well. I have no Pomegranate molasses so I am doing a Pomegranate Wine reduction.